The Restless Earth borrows its title from a collection of poems by Édouard Glissant, a Caribbean writer who probed the question of how different cultures can coexist. The exhibition shares in Glissant's project-a pressing and necessary one that tries to describe this unstable and agitated present as a polyphony of voices and narratives. Through the works of more than sixty artists from more than forty countries-such as Albania, Algeria, Bangladesh, Egypt, Ghana, Iraq, Lebanon, Morocco, Syria, and Turkey-and with historical documents and objects of material culture, this exhibition charts both experiences and perceptions of migration and the current refugee crisis as an epoch-making transformation that is reframing contemporary history, geography, and culture. 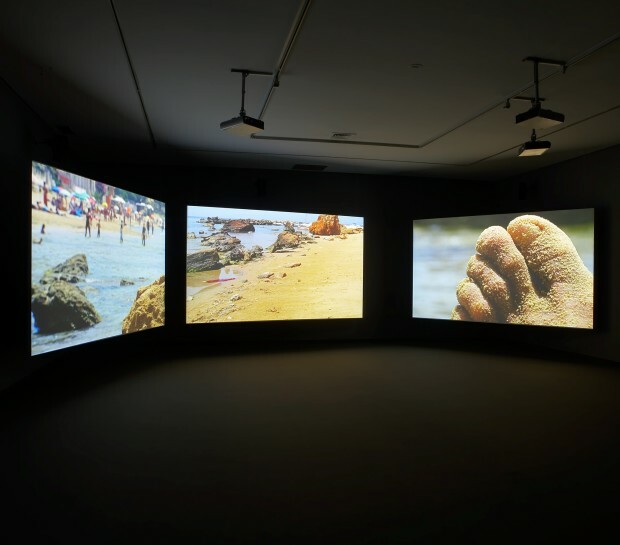 Three screen projection. 35mm colour film, DVD/HD transfer. 5.1 SR sound.